It wasn’t until I went to the northern Thai city of Chiang Mai that I appreciated how a single soup can make a destination live forever in your memory. I was in my twenties, backpacking across Southeast Asia with my travelling buddy Anna. We had escaped Bangkok’s sauna bath heat and planned to make Chiang Mai just a quick layover – until we dipped our spoons into the creamy, golden contents of a certain noodle soup. I swooned. Anna did, too. Then we quickly rallied our reinforcements, digging in with chopsticks now, pulling out a tangle of soft, pliable noodles bathed in coconut milk and spiked with a litany of flavours. We slurped and gobbled, one part spoon, two parts chopsticks, making a crazy mess of ourselves, crowded around a makeshift stall, sitting on wobbly stools perched on a dirt floor. Like everyone around us, we were immersed in our soup, digging out deep licorice Thai basil notes, spiked by the fire of bird’s eye chillies. To our right and left, slurpers stopped only to reach for a lime wedge, giving their soup a slight spritz. We followed suit and could taste fish sauce undertones lift up new, indecipherably delicious flavours. 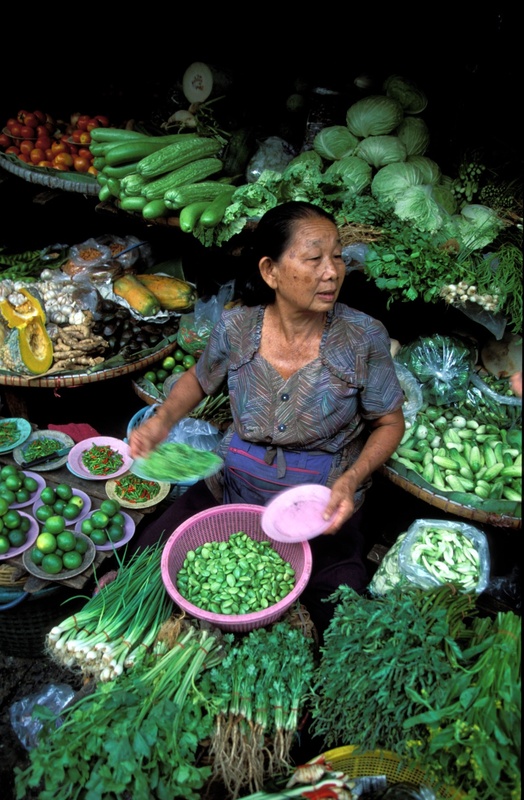 Limes, basil, green onions and fresh coriander sold in Thai fresh market. It was chicken noodle soup unlike anything we’d encountered from Campbell’s. Every morsel had such a cacophony of flavor. Did someone turn up the volume control on our tastebuds? Here is my rendition. You can prepare everything in advance for this soup, except the noodles- then it’s a breeze to serve as a quick dinner or lunch. Purchase a 525 ml can of coconut milk- it’s just the right size for this recipe. 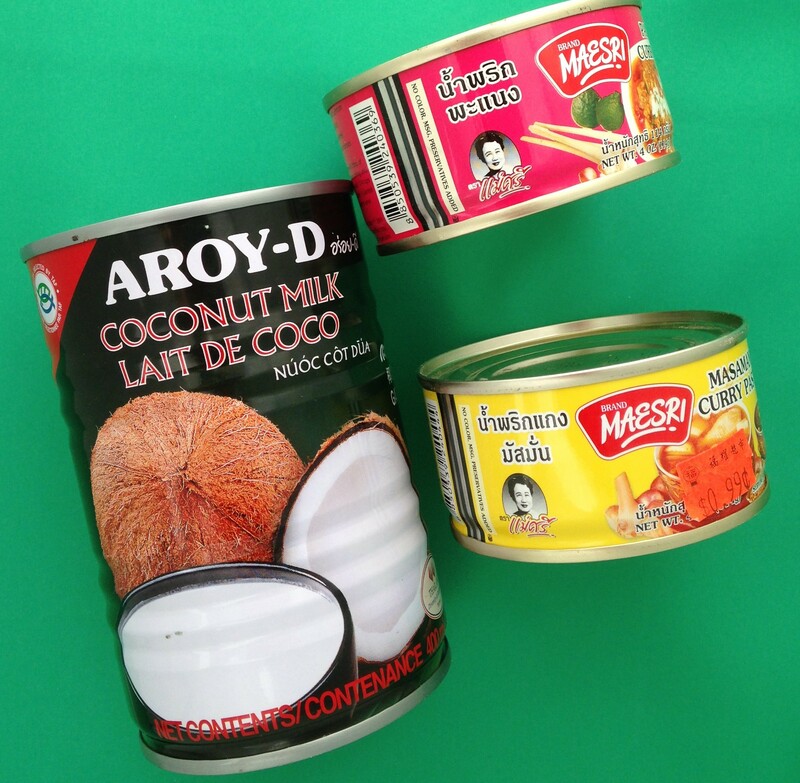 Be sure to buy my favourite brands of Aroy-D coconut milk and Maesri curry paste, pictured above. In a large pot on medium-high, heat the oil. Add garlic and stir-fry 30 seconds or until golden. Add diced red pepper and stir-fry 2-3 minutes or until tender. Transfer to a plate and reserve. Open the can of coconut milk and gently spoon off half a cup of the thick cream on top. Using the same pot, warm the coconut cream at medium-high, whisk in curry paste and turmeric and continue to whisk until coconut cream starts to separate slightly and glisten with oil. Add chicken and stir-fry 1-2 minutes or until chicken is browned and covered with paste. Add reserved red pepper and garlic, remaining contents of coconut milk can, chicken stock, basil, chillies, fish sauce, sambal oelek, sugar and salt. Bring to a boil, then simmer for 5 minutes or JUST until chicken is cooked through. Remove from heat and stir in lime juice. In a large pot of boiling, salted water, boil egg noodles for 2 minutes or until just tender. Drain. 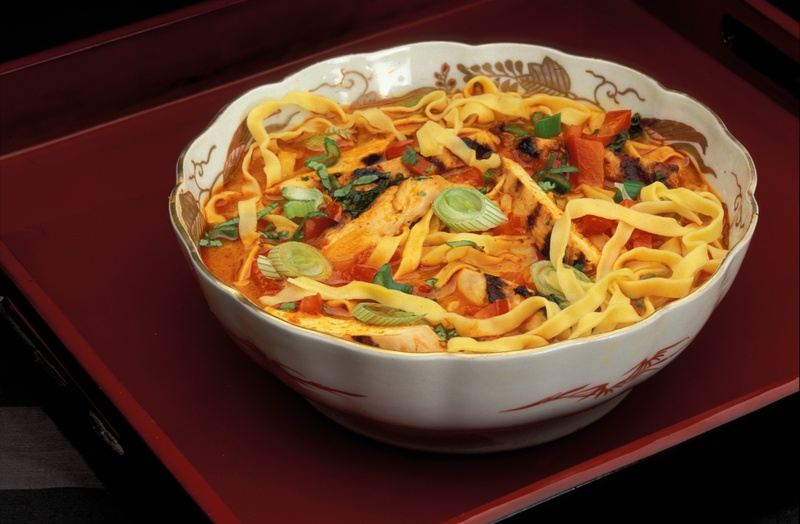 Place one-sixth of the noodles in each bowl and ladle over with hot soup. Garnish with coriander and green onions. 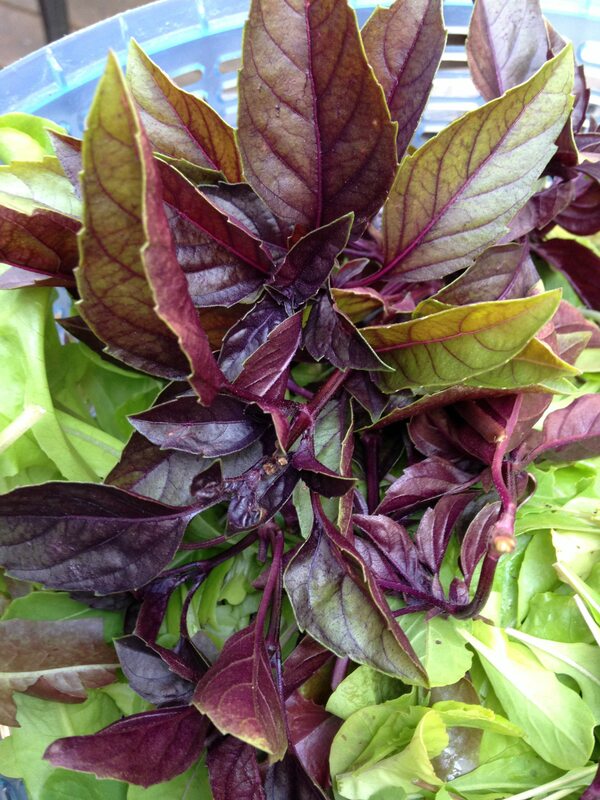 This entry was posted in coconut milk, Recipes, Spicy Thai noodle soup, thai food, Travel + food memoir and tagged chilipeppers, cilantro, coconut milk, curry paste, hot and spicy, lime, noodles, soup, Thai basil, thai food, Thai noodle soup. Bookmark the permalink. Look good and test nice.